This success story was originally posted on USAID's Transforming Lives blog: https://www.usaid.gov/results-data/success-stories/combatting-fear-and-stigma-while-living-hiv-jamaica. “I have HIV,” said Jennifer*. The crowded hall of restless high school students immediately fell silent as she told her story. What they heard was a tale of triumph over a frightening virus and the stigma that it can bring. Thirty-eight-year-old Jennifer, a hairdresser and single mother of four, has been HIV-positive for 14 years. While she is now a strong activist and advocate for the HIV community, this was not always the case. In 1999, when she first learned of her positive status, she feared the stigma that the virus carried with it and, more importantly, the impact that it would have on her children’s lives and futures. That fear almost cost Jennifer her life. In 2006, because she refused to go out to receive required medical treatment, Jennifer’s white blood cell count dropped to a dangerously low level while she was pregnant. It was the effect of HIV on her pregnancy that pushed her to take action. “I told myself, you’re not only living for yourself but for your children,” she remembers. She got involved in Jamaica’s efforts to tackle HIV and AIDS, developing relationships with other people living with HIV and learning more about the virus. And in 2013, she took part in the Health Policy Project’s Greater Involvement of People Living with HIV group, where she learned about the causes of stigma and discrimination. The project is funded by USAID. Jennifer’s advocacy and public speaking are impacting communities on a personal level. Her message of prevention and compassion is changing lives. “I can remember one lady coming up to me after a presentation and saying, ‘You know, I have a sister who is HIV-positive and I didn’t know how to cope with her. But since you spoke, you really have motivated me to go home and help her more,’” says Jennifer. An estimated 32,000 Jamaicans are living with HIV. In 2009, under the United States President’s Emergency Plan for AIDS Relief (PEPFAR), the United States established its first efforts to combat HIV in the Caribbean and created a regional HIV prevention and care program. 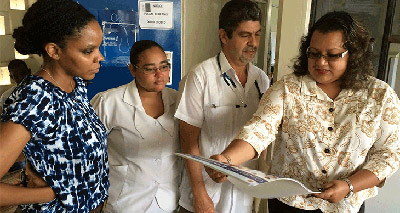 USAID provides assistance through the Jamaican Government and community-based organizations that are implementing HIV prevention programs targeting key populations and addressing stigma, gender norms, and gender-based and sexual violence. Through PEPFAR and USAID, more than 100,000 people in Jamaica have received HIV counseling and testing since 2012.